Safety is a consideration in any type of work, whether in the office, a warehouse or outside. There are many concerns, including personal well-being, liability, regulation, public relations and cost-benefit analysis to keep in mind. There is nothing more important than safety. Every employee wants to go home at the end of the day uninjured. Injuries inhibit the ability to perform work effectively, affecting both the employer and employee. Fatalities have a permanent impact. Roofing is a category of special concern, due to height and fall injury potential for both sales and production personnel. There are two primary areas of concern: ladder safety and fall hazards. According to a study by the Center for Construction Research and Training titled “Fatal Falls From Roofs Among U.S. Construction Workers,” fatal falls from roofs accounted for one-third of all fall-related construction fatalities during the time period 1992-2009. In its findings, the study found that employers with 10 or fewer employees had a disproportionate number of fatal falls, and that Hispanic workers were a disproportionate number of those fatalities. U.S. Bureau of Labor Statistics numbers show that roofing workers are three times more likely to be fatally injured as a result of a fall than other construction industry employees. In an effort to minimize the potential for injury or fatality, the government has instituted various regulations, which are enforced primarily by the U.S. Department of Labor’s Occupational Safety and Health Administration (OSHA). Mandatory roof safety guidelines are an effort to steer the industry towards safer roofing practices. The key components to have in mind are establishing guidelines, training, availability of effective safety equipment, and implementation of procedures that result in a safer work environment. The government, particularly OSHA, has developed guidelines intended to create a safer work environment. Training programs are readily available which interpret the OSHA standards and show how they can be practically implemented, and manufacturers have developed equipment designed to improve worker safety, including new types of ladders, safety harnesses, warning barriers, etc. None of the above is likely to improve roof safety without a willingness on the part of the employer to mandate utilization of safe roofing practices and incorporate into daily operations a culture of safety. Employees need to be trained how to safely do their work, they must be provided the tools and equipment which enable them to work safely, and they must be encouraged to implement safe working practices to minimize the chance for injury. With proper training and availability of the proper tools and equipment, safe operations become a matter of “common sense.” Educated workers realize the value of the implementation of safe roofing practices and hence are more likely to incorporate them in their daily work. Safety is not only a physical issue, it is also an economic issue. As an incentive to incorporate safe practices in daily operations, many workers’ compensation providers offer financial incentives in the form of lower rates, rebates and dividends for lower claims history. This adds to profitability. Realizing the economic benefits of decreased liability exposure due to safe operating practices, many insurance providers offer training programs for free to their policyholders. Costs of development have been paid by the insurer, yet the policyholder benefits in the form of structured training being made available to employees at little or no direct cost. This can be a win-win solution to the question of how to develop and implement an effective safety-training program. 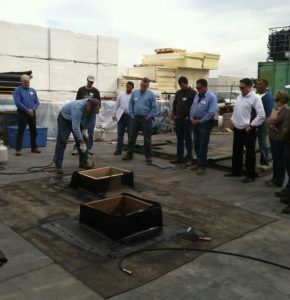 Even more beneficial, the programs have been developed by experts in the area of risk mitigation, who have an incentive to find cost-effective means to practically incorporate safe practices into the daily roofing operations environment. Employers who orient their company toward safe roofing practices seem more likely to profitably grow their business. Yes, there is a cost to train employees and implement safe roofing practices, but this is more than offset by the additional benefits to be gained by having available a properly trained workforce with a culture for safety. The availability of well-trained employees enables work to progress effectively, providing greater likelihood of profits. Safe and uninjured employees are less likely to pose a legal risk. Lower claims result in lower insurance costs, which directly affects the bottom line. Keeping safety guidelines up to date is essential. Employee safety must be an integral part of the company culture. Gathering safety updates via e-mail from government websites allow companies to structure employee training programs and updates to the internal safety procedures. This will enable a company to effectively manage in-house safety programs. When companies have an excellent safety record, there are multiple benefits. A company’s e-mod will continue to move downwards, thereby reducing workers’ compensation costs while helping to ensure employees are able to return home safely each night to be with their families. Customers tend to notice poor safety practices implemented by the employees of their roofer. Along with liability risk, this creates a public relations issue. Not addressing customer concerns can result in loss of customers. Why would a customer continue to contract with a company that obviously disregards the safety of its employees? In the current culture, with its emphasis on the individual, safety is an important area of consideration for any employer wishing to profitably expand. 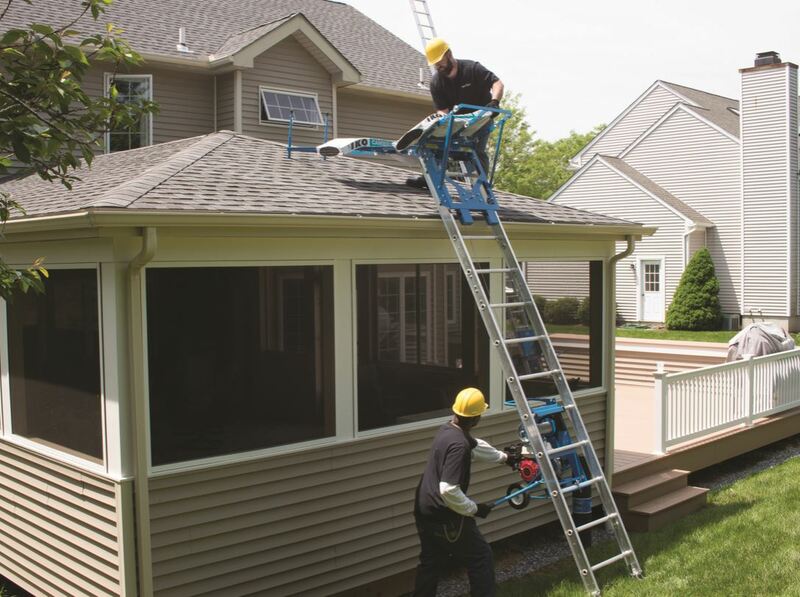 Ladder hoists can easily transport up to 400 pounds of materials to high rooftops. Architects, building owners, contractors, facility managers and other skilled professionals allied with the roofing industry rely on proven safety standards and procedures to keep workers safe. This attention to safety is even more important in areas where natural disasters like earthquakes, hurricanes and tornadoes are a frequent occurrence. Earthquake-resistant roofing: After an earthquake, the collapse of poorly constructed concrete roofs and walls leads to significant injuries and death. This is especially true in economically disadvantaged countries where building codes are absent and financial resources are limited. Lighter roofing materials like aluminum and other metals pose less risk for earthquake survivors, and disaster-resistant monolithic shells made of reinforced concrete show real promise. Hurricane-resistant roofing: Clay tiles and concrete tiles hold up better than wood and other types of shingles in hurricane conditions. In Guam, monolithic domes made completely of reinforced concrete have withstood both earthquakes and hurricanes for 50 years. Of course, the very materials that make buildings resistant to natural disasters—especially the reinforced concrete and clay tiles that stand up to hurricanes and tornadoes—present a greater worker safety risk due to their size and weight. You can still get those bulky, heavy materials to the roof and safeguard worker well-being if you choose the right material hoist to prevent falls, decrease injuries, and minimize the chances of both non-fatal and fatal accidents. Roofing jobs include inherent costs and risks. Transporting materials to the roof is labor-intensive, hazardous work when you must manually carry objects up a ladder. Bulky and/or heavy items increase the risk of accidents, including falls that can lead to death. If you violate the Occupational Safety and Health Administration’s “three points of contact” regulation regarding ladders, you face stiff fines. Boom trucks and roofing conveyors may partially eliminate some of this risk, but they require operator training, rental fees and significant space. They can also potentially cause property damage to driveways, lawns and landscaping. These machines can fail to unload materials safely away from the edge of the roof, which is precisely where you want them. In many cases, an OSHA-approved material hoist is the better, safer alternative. A platform hoist can decrease the risk of injuries, minimize OSHA infractions, prevent accidents and reduce worker fatigue. OSHA ruling 29 CFR §1910.28(a), which took effect in January 2017, puts the responsibility for worker safety—especially the testing and certification of fall-protection systems—on the building owners who hire roofing contractors. 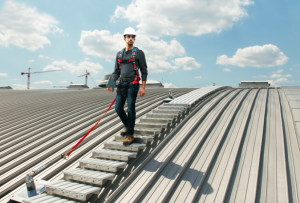 Employers must now provide fall protection for employees who will be walking or working on a surface with an edge that is four or more feet above the ground. Depending on the fall danger, employers are free to choose from guardrails, personal fall arrest (PFA) systems, safety nets, travel-restraining systems, or warning lines that mark a designated work area near a low drop-off. This ruling revised previous industry rules regarding falling, slipping and tripping in the workplace so that the construction rules and the general industry rules are more closely aligned. Unfortunately, repair work—governed by OSHA’s mandate 29 CFR §1926 for the construction industry—and maintenance work—regulated by 29 CFR §1910 for general industry—are still ambiguous. A provision for ladders is also included in the new ruling. A cage, ladder safety system (a body harness and connectors, carrier, lanyard, or safety sleeve), a PFA system, or a well must be included on fixed ladders installed before Nov. 19, 2018, that extend more than 24 feet from a lower level. On or after that date, fixed ladders must include a ladder safety system or a PFA to eliminate or reduce the likelihood of falls. 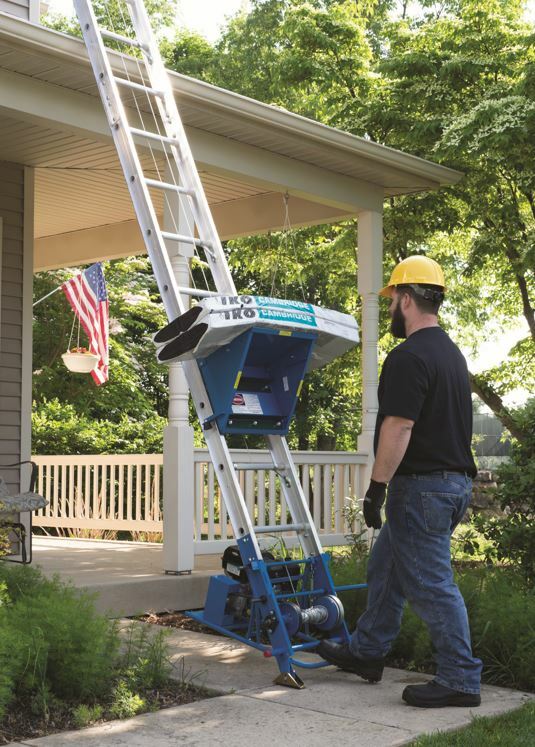 Under the new regulation, roofing contractors using these fixed ladders must ensure their workers’ safety with a cage, ladder safety device, self-retracting lifeline or well. Rest platforms are also required, depending on the height of the fixed ladder. Rope descent systems (RDSs) and their anchorages must be tested and certified in writing by the building owners. Every person going up and/or down a ladder will grasp the ladder with at least one hand at all times, maintaining three points of contact with the ladder—either with two hands and one foot or one hand and two feet. Workers must not carry loads and objects that might cause them to slip or fall. All ladders, including portable extension ladders, fall under these OSHA rules. Ladders must support four times their intended load unless they are labeled “rugged use, extra-heavy-duty,” in which case they are require to support a minimum of 3.3 times their 375-pound capacity. No load is allowed to exceed the published weight limit. Ladders may only be used for their intended purpose. Non-self-supporting ladders must be tilted at an angle so the base of the ladder is one-quarter of the working length of the ladder away from whatever is supporting the top of the ladder. Choose an OSHA-approved ladder hoist to meet these safety standards. For your workers’ safety, choose a material hoist company committed to your safety and to excellence, quality and service. Their products should easily transport up to 400 pounds of materials to high rooftops, keeping your team off of ladders. By handling the bulky, unstable and heaviest objects, a platform hoist decreases the risk of injuries, minimizes OSHA infractions, prevents accidents and cuts workers compensation claims. It also reduces worker fatigue. Choose a ladder hoist with product attachments that can handle the bulkier materials required for natural-disaster-resistant construction. An unloading ramp automatically unloads away from the roof’s edge, increasing safety and efficiency. Custom support braces stabilize your hoist or “laddervator,” protecting workers at greater heights. A plywood carrier can transport bulky material like rolled goods, sheets of metal or plywood, skylights, and trusses, keeping workers safe from carrying unwieldy items up a ladder one-handed. Don’t let unwieldy, heavy objects or special materials that have proven their effectiveness in natural disaster zones keep you from a great safety record. Start with an OSHA-compliant platform hoist. 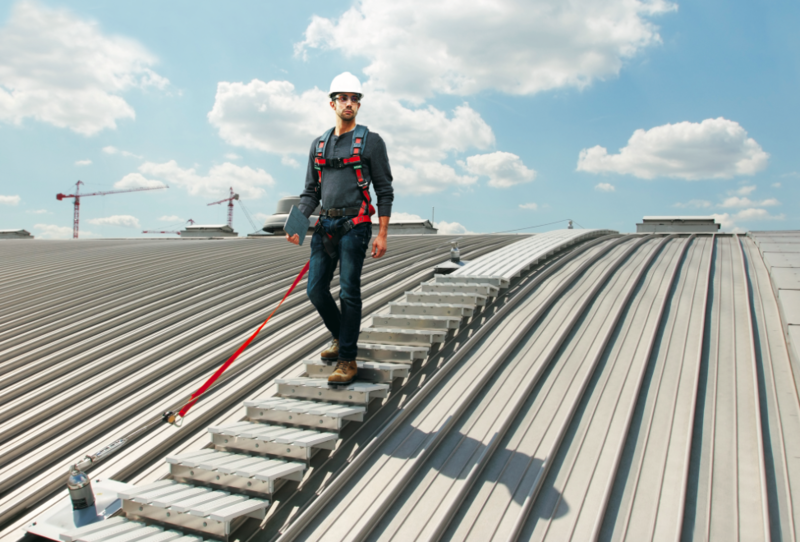 Learn more about this latest regulation at OSHA’s fall protection page. Roofing crew blamed for a Chicago strip-mall fire. Roofer’s torch likely cause of huge Arizona construction-site blaze. Roofer’s blowtorch sparks a six-alarm fire in Hamilton Township, N.J.
Obviously, using an open-flame torch to install torch-down roofing systems can pose a fire risk. Torch-down roofing is a type of roofing that consists of layers of modified bitumen adhered to layers of fiberglass with a flame torch. Torch-down roofing is used only for flat or low-slope roofs. This process is popular with many contractors, mainly because of its ease of installation and its adaptability. With this system, the modified bitumen can bond tightly to metal flashings while the rubbery additives in the asphalt allow the roofing to expand and contract when other roofing systems may crack. In addition, roofers like torch-down roofing because it is easy to apply. Unfortunately, it can also be dangerous! It is easy to make a mistake with the torch that could result in disaster. Consider roofers that are torching down a roof and accidentally overheat something in the attic—insulation, for instance. They end their work for the day, not noticing the smoke coming out of soffit vents. Before long, that smoldering material in the attic heats up and starts a fire that quickly spreads throughout the dry, hot attic and, often, to the rest of the structure. A fire extinguisher must be immediately accessible for all torch-down operations. A fire extinguisher is needed within 50 feet of anywhere where more than 5 gallons of flammable or combustible liquids or 5 pounds of flammable gas are being used on the job site. No one on a job site can be more than 100 feet from a fire extinguisher at all times. There must be at least one fire extinguisher for 3,000 square feet of work area. All flammable or combustible debris must be located well away from flammable liquids or gases. Combustible scrap and debris must be removed regularly during the course of a job. Piles of scrap and debris must be kept at least 10 feet from any building. A fire watch person should be posted to immediately address any possible smolders or flare-ups. The fire watch person should remain on post for 30 minutes after the torch-down job is finished for the day. The requirement for two 4A60BC fire extinguishers during torch work (more than 10 times the firefighting capability required under the OSHA rules). A two-hour fire watch performed after the last torch has been extinguished. 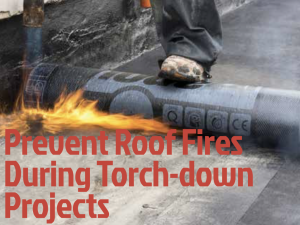 Following these guidelines for fire prevention can protect roofing professionals and the public. It can also save roofers money and time, as well as protect contractors from lawsuits and other legal charges. Visit this site to learn more about OSHA’s Safety and Health Regulations for Construction, Welding and Cutting, Fire Prevention. To learn more about the Certified Torch Applicator (CERTA) program, click here. To follow the OSHA Haz-Com standard, an employer must develop a written Hazard Communication plan. If you wash your windows in your house or car once in a while, the glass cleaner is not subject to the Washington, D.C.-based Occupational Safety and Health Administration’s Hazard Communication standard, which essentially ensures that information concerning the classified hazards of chemicals is transmitted. However, professional window washers use glass cleaners eight hours per day, five days a week, by the gallons and in stronger concentrations. For these people, OSHA’s Haz-Com standard comes into play and the window washer’s employer is expected to have a written Hazard Communication plan—a list of all hazardous chemicals onsite, Safety Data Sheets (SDSs) and the proper container labeling. In the roofing industry, synthetic roofing materials, asphalt roof shingles, adhesives and treated wood shingles all contain hazardous chemicals. In addition, items roofers use every day, like lubricants, hand-cleaning products, sealants, thinners, coatings, gasoline and diesel fuels, and even fire extinguishers, are subject to the HazCom standard. In OSHA’s Top 10 Most Frequently Cited Standards, Haz-Com is almost always No. 2, second only to Fall Protection. Out of 398 inspections in the construction/roofing industry in 2015, OSHA issued 768 citations and collected $443,317 in fines for HazCom. Unfortunately, this number is so high because many companies, who otherwise have an excellent safety record, do not understand or completely disregard the Haz-Com standard. If OSHA comes onto a company’s site to do an inspection for an accident, a complaint, or a visible infraction, an OSHA insprector may ask to see the Haz-Com plan and the SDSs. To follow the OSHA Haz-Com standard, an employer must develop a written Hazard Communication plan, determine what products onsite may be potentially hazardous, provide a list of all the hazardous or potentially hazardous substances onsite, and locate SDSs for all these products. These SDSs must be immediately available for all employees on the worksite during work hours. SDSs are information sheets for one specific product and have 16 standardized sections. The employer is responsible for having the SDSs onsite. The product identifier appears at the top of a container. This is usually the name or code number to the product. Pictograms are a black picture on a white diamond background with a red outline. Pictograms are designed to be easily identifiable to non-native readers. They also make labels more identifiable. The labeling format also includes one of two signal words: “Warning” or “Danger”. Beneath the signal words, there are Hazard Statements and Precautionary statements. 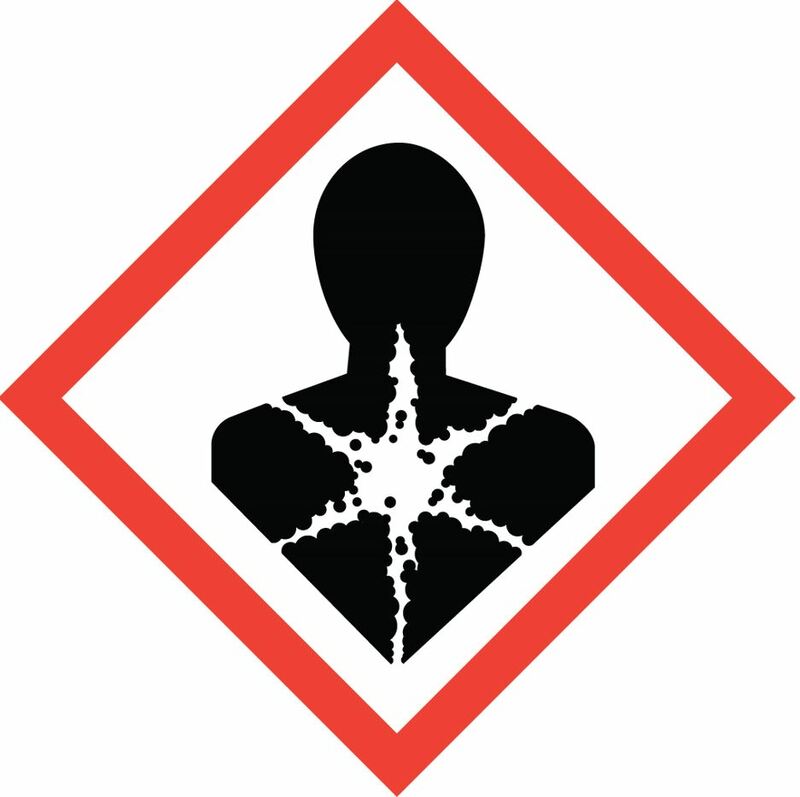 The Hazard Statement tells users how the chemical can be a hazard. The precautionary statement tells users how to protect themselves from the chemical. Usually, on the bottom of a label, contact information for the manufacturer, importer and supplier is included. Training is also important to maintain the Haz-Com standard. Employees must be trained on the types of hazardous materials onsite, the location of the hazardous chemicals onsite, the locations of the Haz-Com plan and the locations of SDSs onsite. Employees must also be trained how to read the labels and SDSs. A recent study released by the Atlanta-based Centers for Disease Control and Prevention noted suicide rates in 2012 by occupational group. According to the study, workers in construction and extraction have 53.3 suicides per 100,000, second only to workers in farming, fishing and forestry (84.5 per 100,000). As such, it is an industry imperative to shatter the stigma surrounding mental health and create caring cultures within our companies. The CDC’s study found that of about 12,300 suicides in the 17 states studied, 1,324 people worked in construction and extraction (10.8 percent) and 1,049 (8.5 percent) worked in management, a category that includes top executives and other management positions. Suicide affects everyone, but some groups are at higher risk than others. Men are about four times more likely than women to die from suicide. However, women are more likely to express suicidal thoughts and make nonfatal attempts than men. The prevalence of suicidal thoughts, suicide planning and attempts is significantly higher among young adults aged 18 to 29 years than adults aged more than 30 years. American Indians and Alaska Natives, rural populations, and active or retired military personnel also have higher rates of suicide. In the construction industry, including roofing, there are several factors that make the possibility of attempting suicide more prevalent. The roofing business is seasonal. We work from April to October and get laid off for several months during the winter. Conversely, during the warm months, long com- mutes and even longer workdays in hot weather, compounded by close bids, tight schedules and stringent quality-control measures increase the stress levels of roofers immensely. Depression can set in during these months. In addition, in construction, we consider ourselves “tough guys”. We believe it is not “manly” to seek help or go to a doctor for medication, despite the fact that some of us will drink alcohol and take illegal drugs to get high. Drug use and addiction are also some of the main causes of the depression that leads to suicide attempts. Unfortunately, men in general are not very likely to ask for help or discuss personal issues. Men may also have easier access to firearms. The CDC says that men are 56.9 percent more likely to use firearms to kill themselves. Changes in behavior or the presence of entirely new behaviors: This is of sharpest concern if the new or changed behavior is related to a painful event, loss or change. Changes in what a person says or does: If a person talks about being a burden to others, feels trapped, experiences unbearable pain, has no reason to live and/or blatantly discusses killing himself/herself, he or she may be having suicidal thoughts. Increases use of alcohol or drugs. Looks for a way to kill himself/herself, such as searching online for materials or means. Isolates from family and friends. Sleeps too much or too little. Visits or calls people to say goodbye. Experiences changes in mood: depression, loss of interest, rage, irritability, humiliation and anxiety. No matter what problems a person is dealing with, the volunteers at the Suicide Prevention Hotline want to help those in distress to find a reason to keep living. By calling (800) 273-TALK (8255), a person will be connected to a skilled, trained counselor at a crisis center in his/her area, any time. The call is confidential and free. If you are in a crisis, whether or not you are thinking about killing yourself, please call the Lifeline. People have called for help with many troubles, including substance abuse, economic worries, relationship and family problems, sexual orientation, abuse, depression, mental and physical illnesses, and loneliness. Signs and symptoms of drug abuse in the workplace are absenteeism, staff turnover, lower productivity, poor work quality and overall poor morale. These can lead to increased accidents and near misses, theft of equipment and materials, and equipment breakdowns. In addition, behavioral issues commonly are associated with substance abuse. For example, addicted workers may exhibit a change in attitude or work performance, erratic performance, hangover symptoms and secretive behavior. Other signs include isolation, forgetfulness, indecision, erratic judgment, impulsive and temperamental behavior, changes in personal appearance and hygiene, jitters, hand tremors, hyper-excitability, carelessness, sleeping on the job, trouble with police, aggression and constant illnesses. If your employees are using, some common sites for drug abuse while at work are lunchrooms and lounge areas, parking lots and cars, remote areas of a worksite, equipment and storage rooms, and restrooms. Marijuana, also known as weed, reefer, pot, etc., comes from the hemp plant (cannabis sativa). About 10 percent of roofing workers claim to use marijuana. In 1974, marijuana had an approximate 1 percent content of THC (the chemical responsible for marijuana’s high). Depending on the grower, today’s marijuana’s THC content can be between 15 and 22 percent. Marijuana is highly carcinogenic. One joint is equivalent to 25 cigarettes. It can be smoked, eaten or vaped. Marijuana affects the user’s mental function. Feelings include a sense of well-being, irritability, insomnia, anxiety, depression, apathy, diminished concentration, delayed decision-making, impaired short- term memory, erratic cognitive functions and distortions in time estimation. Signs and symptoms of marijuana use include impaired tracking, distinctive odor on clothing, decrease in visual functioning and other ophthalmic problems, reddened eyes, slowed speech, chronic fatigue and a lack of motivation. Acute/overdose effects are aggressive urges, anxiety, confusion, fearfulness, hallucinations and heavy sedation. Withdrawal comes with a loss of appetite, restlessness, chronic fatigue and a lack of motivation. Amphetamine, methamphetamine, uppers, speed, crank and ice are similar in makeup and effect. The second-most widely used drug (after marijuana), meth can come in different colors: white, brown, pink. It can be taken orally as tablets or capsules. Its liquid form can be injected or mixed with other fluids and drank. It can also be snorted as a powder. In its rock form, it can be smoked. Within minutes after being smoked or injected, users experience an intense “rush”, which is said to be very pleasurable. Although the rush only lasts a few minutes, the effects can last for up to 12 hours and keep users awake and moving for several days at a time. Meth users build up a tolerance, which forces them to have a strong desire for more. Visible signs and symptoms of meth use are hyper-excitability, dilated pupils, profuse sweating, confusion, panic, talkativeness and an inability to concentrate. Regular use produces strong psycho- logical dependence and increased drug tolerance. High doses may cause toxic psychosis, resembling schizophrenia. Intoxication may induce heart attack or stroke. Chronic users experience increased impulsive or risk-taking behaviors. Withdrawal causes severe depression. The effects of meth are so potent that there is a 95 percent relapse rate. Cocaine was once called the “Rich Man’s Drug” because of its short-lived effects. Regular use can upset chemical balance in the brain. It also causes the heart to beat faster and harder. Deaths caused by overdose can occur when taken with depressants. Signs and symptoms of cocaine use in the workplace include financial problems; frequent absences from work; increased physical activity followed by fatigue, isolation and withdrawal. Cocaine users usually show increasing secretive behaviors and unusual defensiveness. Other symptoms include wide mood swings, nose problems, difficulty in concentration and dilated pupils. Cocaine addicts exhibit the strongest mental dependency of all drugs, and the treatment success rates are lower than all other addictive drugs. One of the worst drug problems in the U.S. today is the opiate/opioid epidemic. Natural opiates are derived from resin of the poppy plant. However, synthetic opioids are increasingly replacing natural opiates. Addiction to opioid medications has impacted every level of society. Many people blame the addiction prevalence on health-care providers who are quick to write a prescription for help with chronic pain. An estimated 210 million prescriptions for opiates were dispensed in 2010 alone. According to DrugAbuse.com, examples of opiates include heroin, morphine, oxycodone (trade names are OxyContin and Percocet), hydrocodone (trade names are Vicodin and Lortab), codeine and fentanyl. Frighteningly, prescription opiate abusers are far more likely to eventually develop a heroin addiction than a non-opiate abuser because heroin will offer a similar high at a cheaper price. Any long-term use puts a person at risk of addiction, even if the substance is used as prescribed. Many people who use opiates will develop a tolerance to them—a phenomenon that can trigger the cycle of addiction. When this occurs, people routinely take more of the substance to elicit the desired response. This ever-increasing dosing places one at great risk for overdose. Physical signs that someone may be abusing an opiate include noticeable elation/euphoria, marked sedation/ drowsiness, confusion, constricted pupils, slowed breathing, and intermittent nodding off or loss of consciousness. Other signs of opiate abuse include shifting or dramatically changing moods, extra pill bottles turning up in the trash, social withdrawal/isolation, and sudden financial problems. Withdrawal symptoms from opiates can be extremely severe. The symptoms mimic the flu and include headache, nausea and vomiting, diarrhea, sweating, fatigue, anxiety and inability to sleep. These symptoms can be so severe that the addict will do anything to feel better. Because falls from roof edges account for half or three-fourths of roofers’ deaths, it’s not difficult to understand why drug use on the job would be concerning. For roofers in residential construction, falls from roof edges accounted for 70 percent of work-related fall deaths and 90 percent of roof fall deaths. These statistics coupled with the statistics on drug abuse in the construction industry suggest that drug abuse possibly may be a contributor to falls.